Danley Sound Labs announces the introduction of two new molded horn loudspeakers – the SM-60M and SM-60F – at InfoComm 2010. Both units feature Tom Danley’s patent-pending synergy horn technology. The SM-60F delivers full-range content, whereas the SM-60M delivers mid- and high-frequency content only. 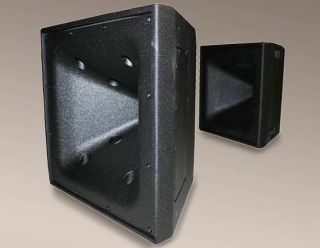 The units are similar in spirit to Danley’s flagship SH-50 full-range loudspeaker, but use fewer drivers and are constructed of molded plastic, making the stock units completely weatherproof (other Danley loudspeakers and subwoofers can be special ordered with weatherproofing at additional cost). Danley has priced the SM-60M and SM-60F to compete favorably with competitive molded horns, even though the Danley designs offer dramatically greater fidelity and directivity. The SM-60M uses just one 5-inch coaxial driver, whereas the SM-60F adds two 8-inch woofers to that design. The SM-60M measures flat to within 3 dB from 270 Hz to 15 kHz. The SM-60F does the same to within 4 dB from 66 Hz to 24 kHz. Coverage patterns for both are 60-deg by 60-deg with both outputting approximately 125 dB continuous and 128 dB program. The SM-60M’s input power ratings are 250 W continuous and 500 W program, whereas the SM-60F rates 800 W continuous and 1600 W program.